For the first time in three product cycles — four if you count iPhone 8 — Apple is issuing a completely redesigned handset to the masses, complete with exotic technology sure to draw in early adopters, upgraders and a fair share of Android switchers. With a full-face 5.8-inch Super Retina OLED display, TrueDepth camera, A11 Bionic chip and an abundance of curved edges, iPhone X marks the start of a new chapter in iPhone history. Gone is the Touch ID home button that for years stood as an iconic symbol of Apple design theory, soon to be replaced by the TrueDepth camera "notch." Stuffed with advanced depth-sensing hardware, TrueDepth powers Face ID facial recognition authentication, as well as front-facing Portrait mode and Portrait Lighting photos. The camera also enables Animoji, a messaging feature that maps a user's facial expressions onto animated emoji characters. Inside, a powerful A11 Bionic system-on-chip hums along, driving iOS 11-only features including augmented reality apps built on ARKit. The silicon boasts its own dual-core neural engine for machine learning tasks, capabilities applied to Face ID and Animoji. Apple is advertising iPhone X as the future, and fans chomping at the bit for new hardware appear to be in agreement. Gauged interest shows consumer intent to buy the latest round of iPhones, which include iPhone 8 models, is at its highest level since the launch of iPhone 6. That demand is being met with a sense of urgency, however, as a steady stream of supply chain rumors report of severe product constraints. Analyst Ming-Chi Kuo, for example, estimates Apple will have only 2 to 3 million units stockpiled for launch. By comparison, buyers snatched up more than 10 million iPhone 6 devices in its first three days of availability. In the old days, when a new iPhone launched, fans stayed up late constantly refreshing Apple.com, or more accurately store.apple.com, to get the moment preorders went live. Prior to that, eager buyers lined up at Apple's brick-and-mortar stores hoping to be first in line to pick up that year's model. Some still make that same pilgrimage today. Indeed, Apple just this week said it would have limited iPhone X supply on hand for walk-in customers. Apple changed the preorder dynamic when it introduced the Apple Store app for iOS. The software grants quick and easy access to Apple's online storefront. Over the past few major hardware launches, the app has proved to be the most stable and often most responsive channel for placing orders. Going through the Apple Store app can shave minutes off the preorder process, precious time that could mean the difference between a launch day device or a second batch unit that ships a month later. Before you steel yourself for the coming ecstatic torment that is iPhone preorder night, you need to get your ducks in a row. Step 1: Download the Apple Store app for iOS. 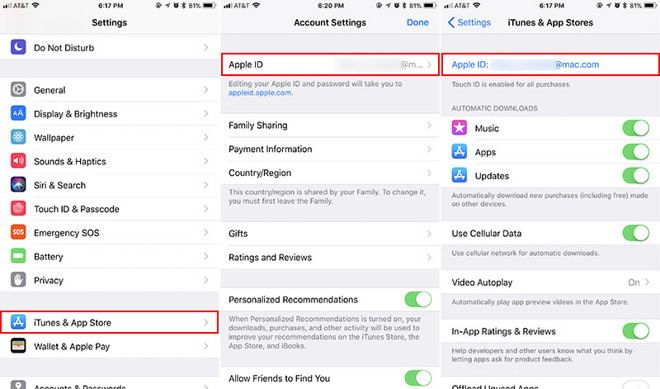 Step 2: Update your Apple ID information by opening the Settings app and navigating to iTunes and App Store > Apple ID > View Apple ID. The Apple Store app automatically pulls Apple ID login credentials from system settings, including preferences like payment information. Step 3: While you're in Apple ID settings, double-check that your Payment & Shipping information is correct. However, it should be noted that Apple Pay is a preferable payment option. If you can, provision a card in the Wallet app. 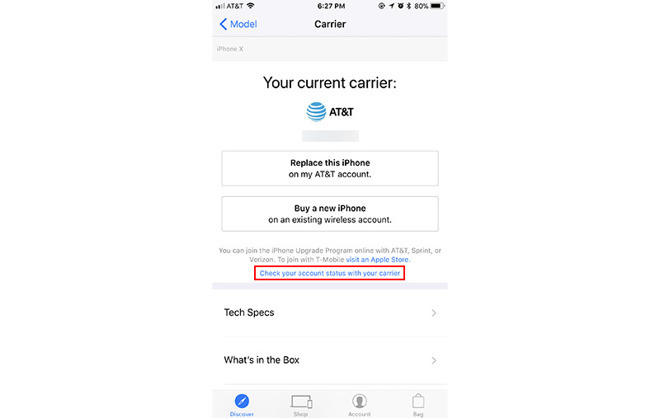 Step 4: If you are a current AT&T, Sprint or Verizon customer looking to upgrade, check carrier upgrade eligibility by visiting Apple's account status webpage, or open the Apple Store app, tap on the iPhone X banner, select a model and tap on the link "Check your account status with your carrier." Upgrade information will be stored in Apple's system for reference when you check out on Friday. Note: This step can be skipped if you plan to pay for iPhone X in full, or want to purchase an unlocked version. 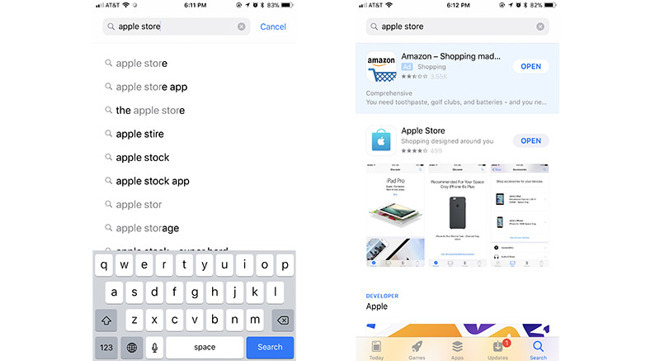 Step 1: Open the Apple Store app and tap on the large iPhone X banner at the top of the screen. Step 2: If you're on an iPhone, select whether you intend to Replace this iPhone or Buy a new iPhone on an existing carrier account. Step 3: Select your desired color, either silver with white rear glass or Space Gray with black rear glass. Step 4: Choose a capacity, either 64GB or 246GB. Step 5: Select a payment option. 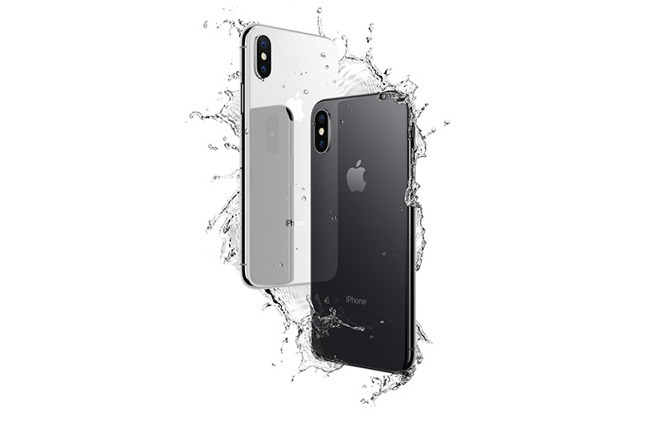 Depending on your carrier, these could vary, but Apple's iPhone Upgrade Program and iPhone Payments plans are static choices. Buyers can also elect for a One-time payment. iPhone Upgrade Program pricing is $49.91 per month for 64GB or $56.16 per month for 256GB over the course of 24 months. This option includes annual upgrades and AppleCare+ warranty coverage. iPhone Payments pricing is $41.62 per month for 64GB or $47.87 per month for 256GB over the course of 24 months. This option does not include annual upgrades or AppleCare+ warranty coverage. One-time payment pricing is $999 for 64GB or $1,149 for 256GB. 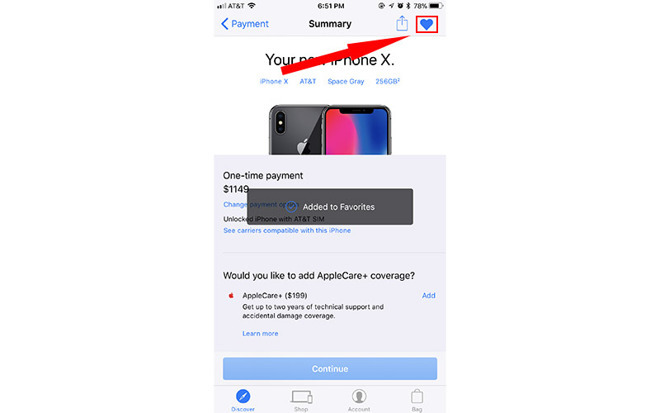 Step 6: Tap the heart icon at the top right of the purchase summary screen to add your iPhone X configuration for later retrieval. Step 1: When preorders go live on Friday, Oct. 27, at 12:01 a.m. Pacific, 3:01 a.m. Eastern, open the Apple Store app and navigate to Account. Step 2: Tap on the iPhone X configuration saved under My Favorites and tap Continue. Step 3: Have your carrier information ready: wireless number, billing zip code and social security number. The data fields should already be filled out, but it's good to have the information on stand-by just in case. Step 4: Navigate to your Bag and pay with Apple Pay or another credit card. As mentioned, Apple Pay will be the fastest checkout option and is therefore preferable to other forms of payment. Earlier this week, Apple opened up loan pre-approvals for iPhone X. 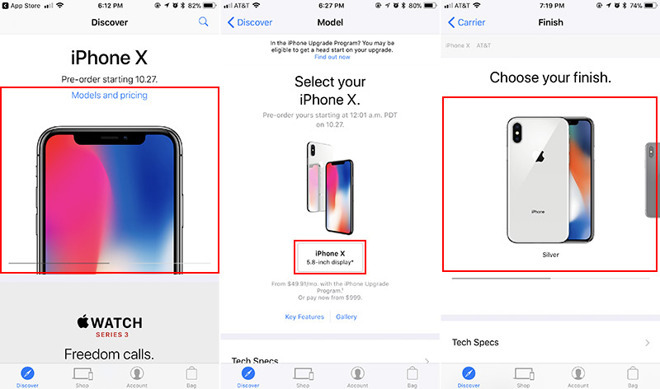 This process can be accomplished by opening the Apple Store app and navigating to the iPhone X landing page. A block of text reads, "In the iPhone Upgrade Program? You may be eligible to get a head start on your upgrade." Click on the link that reads Find out now and provide Apple with your member information. Apple opens preorders on Friday, Oct. 27, at 12:01 a.m. Pacific, 3:01 a.m. Eastern. The system usually takes a couple minutes to activate, so we suggest constant refreshing of the Apple Store app. 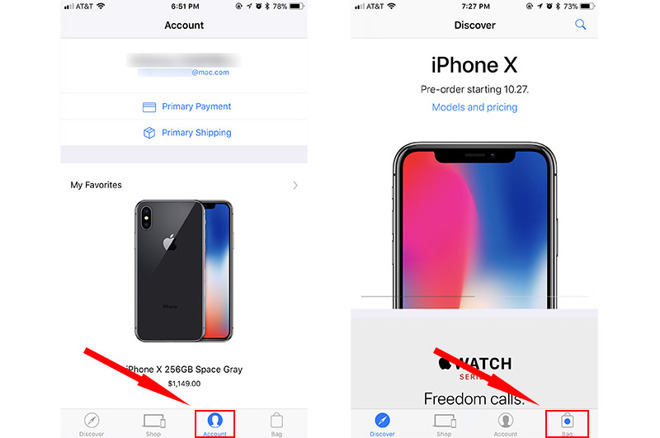 If you get word that preorders have gone live, but the same is not showing up in your app, force close the software by double clicking on the home button and swiping up on the app card. Reopening the app should solve any issues. It is best to also keep Apple's website open and refreshed during preorder proceedings, just in case something goes wrong with the app. Major carriers are also slated to take their preorder systems live in sync with Apple, offering yet another route to success. If all else fails, Apple retail outlets will have a limited supply of handsets available on Nov. 3.